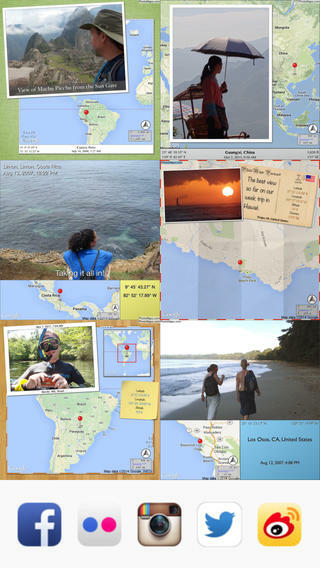 FREE today – Photo Mapo, an easy-to-use photography app/fabulous tool for classroom projects. This app easily transforms any photo into a mapped masterpiece. The app features twenty-three styles. Projects can be customize by changing the background, map type, & zoom level. There is also an option to add a 180 character description. Finished projects can be shared by email or saved to the camera roll. How fabulous!! Kids can use this app to connect events (real or make-believe) to their settings. They can use it with: pictures of grandparents/great-grandparents to show their native countries, with scanned drawings of story scenes to show the setting, with pictures/drawing of animals to show their habitats, with historical photos to show locations, etc. Kids could also create virtual postcards with this app. Photo Mapo has loads of potential for classroom use!